Below we will learn of a few of Denmarks hundreds of selfmade Turbine builders. A few Turbines turns out to be prototypes for the wind industry that emerges from 1979. In the pages about TVIND and FOLKECENTER you will find additional pioneer turbines. In 1975 Claus Nybro was co-editor of the very important Danish Wind knowledge Book : "Sol & Vind Håndbogen" The book was issued by Informations Forlag in 1976. Claus was editor of the wind part. In summer 1976 Claus started designing a 5 kW Wind Turbine at the small Island of Endelave together with Engineer Rio Ordell. In april 1977 the practical work started. For this first prototype, the "Holger Danske 1" Claus designed and made the Fibre Glass blades and Rio Ordell was engineer and manufacturer of the Nacelle. The construction took place in a primitive unheated former hen house at the Endelave Farm. The test operations began in early spring 1978. From August 1978 a new 22 kW turbine was developed on the basis of the Endelave experiments. Claus Nybroe, Rio Ordell, Hans Dollerup and Flemming Allerslev established the small company Dana Vindkraft in spring 1978. The company moved from Island of Endelave to the buildings of a closed down dairy in Rask Mølle on the Jutland mainland. In November 1979 this company erected its prototype 22kW Turbine at Kolding Højskole, a visionary, innovative and "green" Folk High School near Kolding. At easter time 1980 it was inaugurated. In 1986 it was de mounted and sold for reuse in another location. A fire in the Nybroe home at Funen destroyed all the old photos and negatives from the Claus' pioneering days. Therefore many images here are scanned from brochures of Dana Vindkraft. (Bulletin no. 1 of August 1978 and Bulletin no. 2 of April 1979. Claus Nybroe later began manufacturing multi bladed wind roses , the Sunflower Turbines. Today Claus does a regular part time job for Siemens Wind Power. Rio Ordell later worked with Windmatic, and was the key engineer behind the very successful Tellus Turbine. Rio also was one of the earliest CEO of the Danish Wind Turbine Manufacturers Organisation. In 1987 Vestas tried to headhunt Rio to become CTO of Vestas, Rio declined, and stopped working in the wind business from then. 1974 Ricard Matzen & Sonne Kofoed, Tåstrup, Copenhagen. 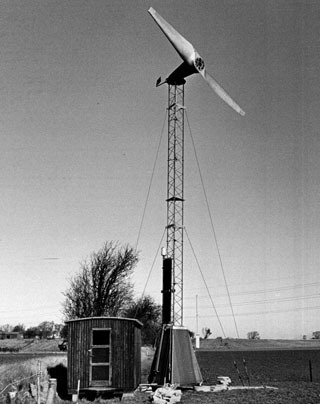 At the Institute for Agricultural Techniques there was an ongoing wind turbine development in the seventies. Two comitted researchers, Sonne Kofoed and Ricard Matzen developed two turbine prototypes for heat production intended for farms. A good waterbrake system was developed. This was not a grass root project, as the researchers were payed by their institute; but still it represents an early effort towards development of renewable energy, driven by the personal engagement of the two researchers. The water brake idea was not commercialized in the early days, but some further attempts was made by private companies to do this: The "LOFA varmemølle" by Knud Berthou, and many years later the Calorius 5 meter diameter Turbine by Hans Henrik Ekner, that was produced from 1993 to 2007. Many self builders has build heat producing turbines using asynchronous generators with electrolytic condenser magnetizing. The electricity was then fed into a dump load in a heat insulated water storage tank. Often the Company TRANSMOTOR, that sold ship generator systems helped with this. Key person here was engineer Aage Larsen. Jørgen Andersen owned a metal workshop in Northern Jutland and built this turbine for heatproduction. Like the Matzen and Sonne turbine it utilized a water brake, placed inside the bottom of the tower. ( insulated round tank seen under the small roof). Inside the house a 20.000 litre water tank accumulated the heat produced by the turbine. The prototype was never put indto serial production. Before 1975 Christian Riisager installed a waterwheel in the stream in his backyard. The waterwheel produced electricity for lights in his garden. 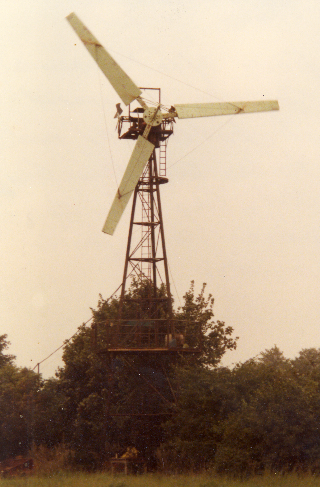 As the stream was weak in summertime, he started building a wind turbine in 1975. On April 29th 1976 he was granted permission by the Herning Electricity board to connect his new 7 kW Turbine to the grid. Without asking for permission, he had some weeks earlier connected the Turbine to the grid. He asked his neighbours, if they had any problems with their TV sets and other household appliances.The answer was "no". He was a little worried: Could his machine damage their electrical aparates ? When the Turbine produced electricity, the eletricity meter rolled backwards.. In month of May 1976, the electric utility company connected a kWh-meter to the Turbine, and on May 12th the meter read 11 kWh. 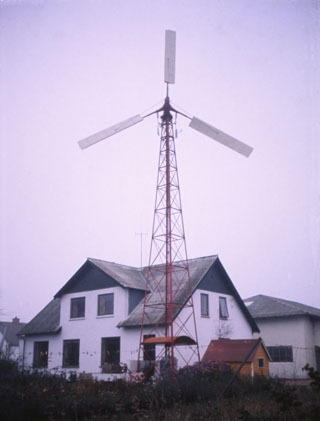 The turbine was noticed by the public, and in summer 1976 a journalist from the Danish newspaper "Information" became aware of the turbine, and visited Christian Riisager. The journalist asked, if Riisager was willing to build a turbine for his home also. Name was Møller, Torgny Møller who later became founder of the Turbine owners organization: "Danske Vindkraftværker", and also publisher of the two monthly magazines Naturlig Energi and Wind Power Monthly. Riisager immediately started a production with the help of a Erik Nielsen, who had a metal workshop in Herning. Already in the first days of November 1976 the first 22 kW turbine was erected at Torgny Møllers place in eastern Jutland. And soon the next 22 kW turbine was delivered to Carsten Fritzner in Boddum, western Jutland. Riisager who was a carpenter, cooperated with different mechanical shops for the construction and welding of the metal parts, whereas he himself build and designed the blades with the central laminated wood main beam. A total of 75 turbines were produced in sizes from 10 kW to 45 kW. In 1979 Riisager sold the rights of production to a new formed company named Windmatic. Windmatic 45 and 75 kW turbines are still operating well in California more than 25 years after. Due to disagreements with the owners of Windmatic, Riisager stopped cooperating with them in 1983. For a short period Riisager worked on a 45 kW turbine project at Oxholm, in northern Jutland. He then moved to the Faeroe Islands, where his son was working as a helicopter pilot. Soon he developed new and bigger turbines in cooperation with the Self ruling government of the Faeroe Islands, but these turbines never went into serial production. Christian Riisager died in June 2008, working with carpentry in his shop until his death. 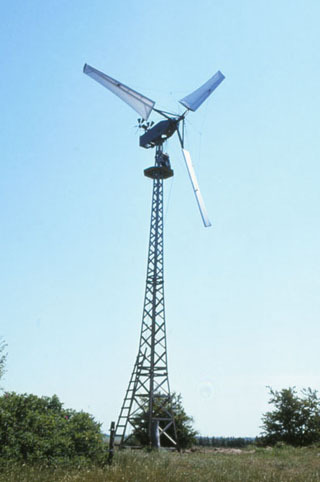 In 1974 Esra L. Sørensen built this heat producing upwind turbine with 13.4 m Rotor Diameter, near the city of Hedensted, Jutland. Hub height is 18 meter. Esra started building his first turbine in November 1974. Like other selfbuilders he used second hand materials collected at the junk yard. The blades were built in steel and aluminium. The electricity from the generator in the nacelle was heating up a 10.000 litre insulated water tank in the Sørensens home, securing all year heating for the family. Karl Erik started working on his first wind turbine around 1973, a 2 kW two bladed turbine with steel spar, steel ribs and a cover of thin aluminum plating. The turbine delivered 220 Volt to heating elements in a heat storage tank in the family home. In the spring of 1978 Karl Erik Jørgensen met the young student Henrik Stiesdal (read about Henrik below) who was also a dedicated self-builder. At the time Karl Erik was assembling his second turbine, a wind rose turbine with aluminum blades that should also produce heat for the family. Henrik persuaded him that a three-blade turbine would be better than the wind rose. Henrik could design one and Karl Erik could build. They jointly applied for funding from the Danish Technological Institute and rapidly acquired a grant of 50.000 DKK for a 22 kW prototype turbine with a novel design. On July 1st. 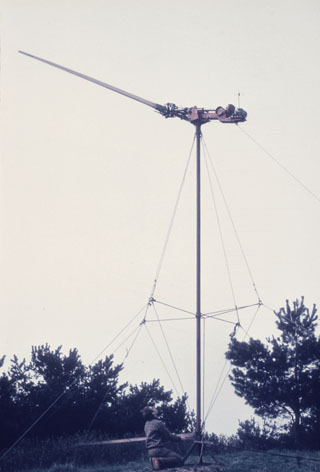 of 1978 Økær delivered the first set of fibre glass blades to Karl Erik and in August his 22 kW prototype was connected to the electricity grid and house with workshop. Only weeks later, on September 2nd, the turbine had a run away and the blades were centrifuged away from the hub. The reason for the run away was, that a relay came loose, and the emergency stop concept was asking the turbine to yaw the rotor out of the wind, and after that to activate the hub brake. In few seconds the rotor accelerated to several hundred rpm and the centrifugal force pulled the blade attachment to the hub apart, and all three blades were simultaneously sent in different directions. The lesson learned was, that the blades needed aerodynamic fast acting brakes to prevent a run away. 14 days later, another self builder turbine with Økær fibre glass blades, at Stoholm, had a catastrophic run away. These failures led to Økær's introduction of turn able tip air brakes (see Blade story). When Erik Grove-Nielsen had finished, and delivered the first set of Økær blades with turn able tips on November 13th, only a few days passed, un till Karl Erik had the blades mounted and was ready and eager to test the new safety system. He called Erik and said: " The blades are mounted, and now we shall test the air brakes" - Erik answered that the weather - being windy with 15 m/s - had to calm down, so that we could securely make the first test at 8 - 9 m/s...but Karl Erik did not want to wait further and answered: "then I will do it on my own". Consequently Erik in a hurry had to lease a strip chart recorder and some other equipment for documentation of the test, and also make arrangement with an "official person", being Carl Zøylner from the Technological Institute of Århus, to attend and witness the test. The successful test, later that same day, was a great relief to all, including of course Karl Erik Jørgensen and Erik Grove-Nielsen of Økær. Early experiences showed that the main components should be stronger for a really robust machine, and it also seemed that the 10 m rotor could take a larger generator. Henrik Stiesdal and Karl Erik therefore jointly designed a 30 kW turbine having more or less all the features that would characterize the “Danish Concept”. In 1979 Karl Erik supplied two 30 kW turbines to customers in Western Jutland. It was clear, however, that he could not manage to establish a real turbine factory. Karl Erik's son Per, noticed that Vestas, who then produced farm equipment, was experimenting with a Darrieus wind turbine, without much success. Therefore, Henrik Stiesdal and Karl Erik called Vestas and invited them to see his turbine. A few month later Vestas signed a license agreement with Karl Erik Jørgensen and Henrik Stiesdal. Karl Erik wanted to manufacture even bigger turbines already in 1979, so he urged Erik Grove-Nielsen of Økær to develop a new blade for a 55 kW turbine. This became the very popular 7.5 meter Økær blade. Later known as the AEROSTAR 7.5 meter blade. 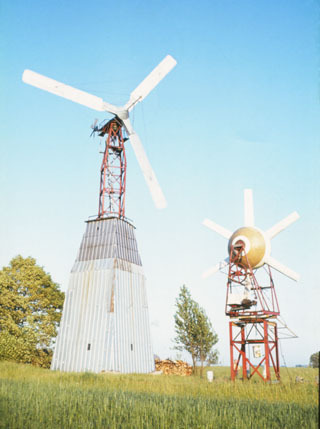 This first 55 kW turbine was developed by Karl Erik Jørgensen and Henrik Stiesdal, and built by Karl Erik in the small Herborg workshop in the early spring 1980. The first set of 7.5 m blades were delivered to the Vestas site in Lem on March 13th. 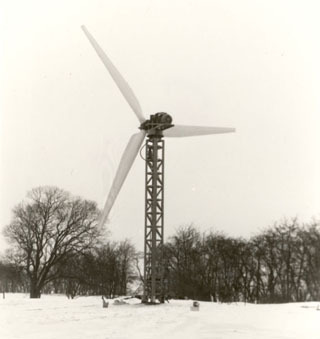 1980, as the prototype was to be erected at the Vestas factories at Lem. The license agreement with Vestas entitled Karl Erik to build a number of turbines himself, and during 1979 - 82 he built a total of six more turbines, most of them to serve as retrofits of failed turbines from others. In 1981 - 82 Karl Erik and Henrik developed a unique planetary gear box integrated with a blade hub. The gearbox design was declared winner of a local entrepreneur award , and the prototype was mounted on the 22 kW turbine at Karl Erik's home. A license agreement was signed with ALTERNEGY, who also manufactured the AEROSTAR blades. Only a few of these integrated gear units were manufactured though. Wind diesel pioneering: Karl Erik was a man of few words, but much action. He acquired a used Bukh tractor diesel, and mounted it on an old German occupation army gen set to produce electricity to the family home and machines in the workshop. The heat from the motor cooling system was used for heating the house and workshop. In some periods the installation was coupled off the electricity grid, and the system served as a perfect wind-diesel unit. Because of its special low frequency noise - that was heard throughout the house, the machinery - in the family jargon - was nick named "æ dunderwærk". In the 1970s Karl Erik had been struck by cancer, and during the entire wind adventure he was formally a 100% disabled invalid - which did not hold him back, however! In 1982 the cancer appeared again and disabled Karl Erik to an extend where he was no longer able to climb the tower of his experimental turbine. Therefore he built an elevator for the lattice tower. The elevator could bring him to the nacelle. On October 2nd of 1982 Karl Erik died after a short period in hospital, leaving a daughter, 3 sons and his wife Alma. He was buried at the Herborg Church cemetery, only a mile from his beloved workshop. Karl Erik Jørgensen, in companion with Henrik Stiesdal created important development and maturing of the Danish wind turbine design. Karl Erik and his family never got wealthy, instead every day was a fight for economical survival. Every hour of the week was devoted to the development op wind turbines. Jens Erik built his Turbine much like Johannes Juhls Gedser Turbine, with asynchronous grid connected generator and aluminum plate covered blades with a steel spar and stay wires from the blades to a connection in front of the hub. Hub height was 14 meter and the rotor diameter 10 meter. The blades had no aero dynamical brakes, and Jens Erik of course once had a runaway with this turbine. The turbine is still there today, on its tower, but it is not operating. Most components were reused parts found on the junk yard. A heat producing upwind turbine with 7.7 meter rotor diameter and 13 meter hub height. Blades built in laminated wood covered with fibre glass. Airfoil was NACA 4415. Electric asynchronous Generator of 11 kW. Electricity fed into heat accumulating tank. Arne Friis, Kærbølling, owner of a small enterprise selling grinding tools and equipment for mechanic shops. (Friis Værktøj). Friis was "on the road", and had customers around the country. Friis organized regular meetings for this Wind Turbine building group. Leif Nielsen, Plougstrup, an electrician with his own company. Henry Jørgensen, Thyregod, a hydraulics equipment serviceman. Svend Adolfsen, Knudstrup, an electric and automobile technician with his own shop. Torben Andersen, Bredsten, a teacher living in the countryside. Leif Nielsen was the first to build and install a Turbine with three 4.5 meter Blades, made in the Tvind PTG mould by TV Glasfiber. 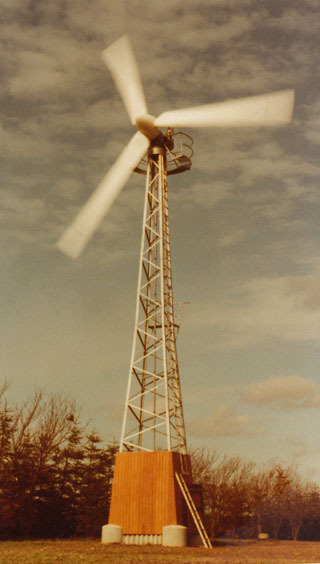 Beginning of November 1977 Leif Nielsen's Turbine was operating. In september 1977 Erik Grove-Nielsen borrowed the blade mould, and later bought it, for his new company Økær Vind Energi. At low windspeed, on June 11th 1978, one blade of Leif Nielsen's turbine failed totally in the root section. On June 12th a self organized accident investigation team met at Tvind, from where Jens Gjerding drove an old Mercedes car to the failure site near Esbjerg. In the car was Jens Gjerding of Tvind's "Vestjydsk Energikontor" (Later co-founder of Tripod Consult- Now COWI). Henrik Stiesdal, who was a member of the O.V.E. Wind Turbine Safety Group, worked on his own Turbine project, and also cooperated with Herbog Vindkraft. Now Henrik is CTO of Siemens Wind Power. And Erik Grove-Nielsen, also member of the OVE Safety Group and blade producer with his company Økær Vind Engergi. This initiative was probably initiated by Jens Gjerding, who designed the PTG blade. The conclusion of the investigation was clear: The Glass Fibre company (TV Glasfiber) had made a serious production fault, as only a few of the glass fibre roving bundles, that should run from the blade interior, around the root bolts, did so. The root was extremely weak. Initially Leif Nielsen planned to be a manufacturer of wind turbines. In February 1978 he thus wanted quotations for 4.5 and 6 meter blades from Økær Vind Energi. After the failure in summer 1978 he sold his own turbine to a retired farmer in the neighbourhood, and stopped working with wind turbines..
On November 26th 1977 Svend Adolfsen got his first set of blades from Økær Vind Energi. The very first set of Økær blades was delivered to Teacher Torben Andersen - of the 5 Turbine group - Torben had some problems getting his turbine up and running, and finally it was downed by a storm. Svend Adolfsen worked very fast and smart, and he soon had the Turbine up and running on a 6 meter tower! Later he prolonged the tower for 12 meter, and then 18 meter. For a gearbox he used part of the rear axle transmission from a truck, including the brake system, the rest of the rear axle with brake system was cut off and used as yaw bearing. Like many other selfbuilders he kopied this construction from the small 18 kW PTG turbine at Tvind. Svend soon started serial production of his turbine: The turbine owner would himself make the concrete foundation and sometimes the lattice tower, Økær would deliver the blades and Svend would build the nacelle and install and run in the total turbine, with the help of the owner. In 1979 Svend sold his rights of production to Alfred Christensen of Kuriant Maskinfabrik at Ulfborg, a few kilometers from Tvind. 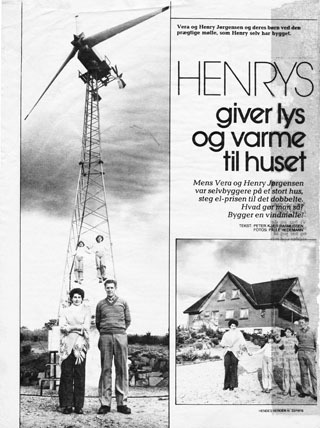 December 1977 Økær Vind Energi delivered the blades for Henry Jørgensens selfbuilt Turbine. The first set was the 4.5 m Tvind design blades. In 1978 Henry bought 5 m Økær blades with tip air brakes. Henry was the selfbuilder who - back in october 1978 told Erik Grove-Nielsen of Økær, not to use parachutes for emergency brakes. 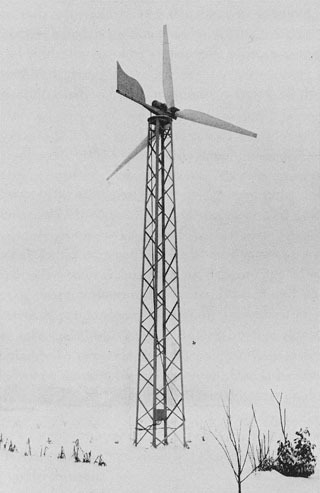 Henry suggested that Erik designed a system similar to what the GEDSER Turbine used. And consequently the blades got turnable tips. Henry's turbine design was clever. His machine was working well and produced electricity to the grid until 2002. It was finally demounted and sold to a man at Funen in 2007. In 1979 Henry had negotiations with Riisager about a cooperation, but they did not agree on the blade issue. Henry demanded, that the turbines be equipped with fibre glass blades, whereas Riisager wanted to stay with his own blade type with a central wood spar. Riisager claimed that "wood is born flexible by nature", and thus a better choice for loaded structures. Consequently no further cooperation was made between Riisager and Henry Jørgensen. Also Alfred Christensen of Kuriant was visiting Henry. Alfred was delighted by Henry's design, and later told Henry, that he wished he had made a licende agreement based on Henry's up wind design, instead of the down wind design of Svend Adolfsen. Courtesy of ladies magazine "Hendes Verden"
In June 1976 Henrik, living with his parents in Helleskov, Vildbjerg near Herning, finished high school. Summer 1976 he worked on different small jobs and then traveled around Britain the rest of that year. At Christmas time Henrik with his father visited the Tvind Turbine building site, and like many other he was impressed and inspired be these young people building a megawatt wind turbine. In spring 1977 Henrik and his father visited Tvind several times, and had good help from Jens Gjerding of "Vestjydsk Energikontor" in finding literature on wind energy. Most inspiring was "Sol & Vind", a handbook by Claus Nybroe and Carl Herforth. 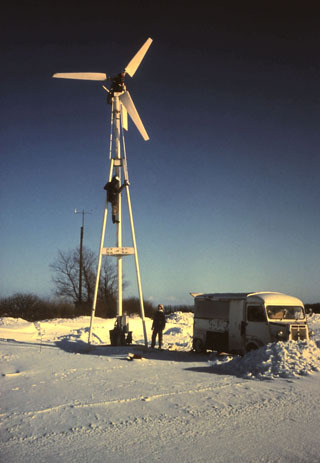 Information here, about the Princeton University Sail Wing inspired Henrik to build his first primitive turbine (MK2) in early 1977: A 3 meter diameter sail wing two bladed rotor installed on an agricultural trailer, enabling it to be taken in and out of the wind. From month of May 1977 to February 1978 Henrik was conscripted into the army and did not have much time for wind power. However, after finishing the service it only took a few month for Henrik to design and build his first "real" wind turbine (MK3): A 15 kW grid connected turbine with a 9 meter diameter Sail Wing rotor. In May 1978 the Sail Wing blades were finished, and on June 28th the turbine was erected and inaugurated. ( See pictures in slide show). During his construction of the machinery for the Sail Wing Turbine, Henrik visited a nearby mechanic work shop to have a certain production detail problem solved: Herborg Maskinværksted, by Karl Erik Jørgensen. A friendship was begun, and the cooperation of Henrik Stiesdal and Karl Erik Jørgensen became significant, and resulted in the HVK turbine, that was later licensed to Vestas and became the starting point of the Vestas wind adventure (1979). When a robust anemometer was needed, Henrik developed it, all including the design and lay out of the printed circuit boards etc. The "Helleskov Vindmåler". 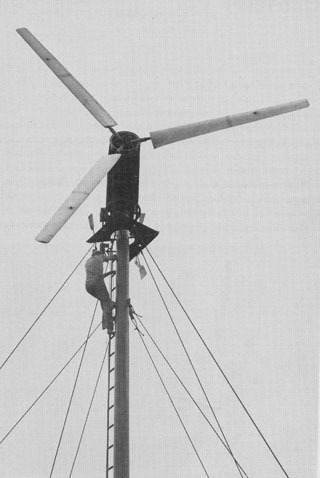 This anemometer was later included on Vestas turbines. In spring time 1979 Henrik worked for some months as a student employee at the newly established Test Station for Small Wind Turbines at RISØ National Laboratory near Roskilde. Henrik set up the first technical consultancy function for the owners' organization Danske Vindkraftværker, and among other jobs here he was - together with Karl Erik Jørgensen - for some years - a key person in organizing the reporting of monthly statistics of electricity production from most of the Danish wind turbines, spread throughout the country. The statistics were published every month in the magazine "Naturlig Energi". In October 1979, RISØ established an (idea competition ) in order to promote new innovative turbine design. One of the two main prizes was awarded to Henrik. The turbine was a 20 kW pitch controlled 3 bladed, upwind turbine with a 11 kW asynchronous slip ring main generator producing grid power from the stator and heating power from the rotor. The rotor diameter was 11 meter. It was later built by Vestas in cooperation with Henrik and tested at the RISØ test station. Henrik sold the license to use this technology to Vestas. The turbine was not put into serial production, but the experience with pitch systems formed the basis for Henrik's design of the first pitch controlled Vestas turbine, the 200 kW V25, which was introduced in 1986. Henrik commenced studies for Medicine at Odense University in September 1979 and finished part 1. in 1982, then had a one year leave, and in 1983 he continued the medicine study, but soon changed course for studying physics and biology in 1984. The first 3 years of studying was financed by his royalties from the licenses given to Vestas. From September 1983 until November 1986 Henrik was employed by Vestas on a part-time basis as design engineer, and here he designed the first pitch regulated Vestas turbines. During 1986 Vestas came into financial crisis and ultimately went bankrupt in 1987. In the fall of 1986 Henrik found the development unsatisfactory and resigned from Vestas, aiming to concentrate on his university studies. The attraction of the wind industry was too high, however, and on March 1st. 1987 Henrik was employed by wind turbine producer Bonus Energy in Brande. In 1988 Henrik became technical director of the company. When Siemens acquired Bonus in 2004, Henrik became, and still is - chief technical officer CTO of Siemens Wind Power. Burmand was a resident in Christiania, the "alternative life" part of Copenhagen. 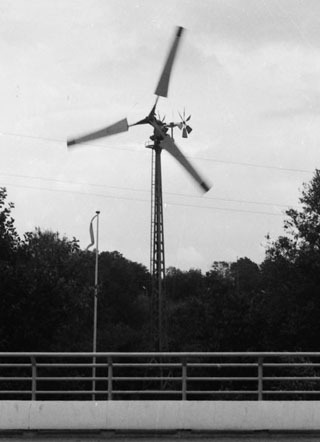 He developed a smart and sophisticated one bladed "nice weather turbine" (Let vejrs mølle). Burmand was a skilled mechanical engineer with outstanding mathematical skills as well. The prototype turbines all worked well, but never went into serial production. The first turbine was erected at the Svanholm Manor, which is an intentional community located near the village of Skibby, 60km from Copenhagen. His later turbines were erected near the village of Sønder Hygum in Southern Jutland. A very similar design was adopted by German Aerospace company Messrschmidt Bölkow Blohm MBB for a one bladed 25 kW turbine, and later the 1 Megawatt Monopteros one bladed turbine. The Aerospace company however, was not able to make a successfull entry in the commercial wind turbine market. See MBB under European turbine makes, Germany.